The Football Association is planning to scale its five-a-side tournament with better experiences for players and fans. The body has appointed agency Limelight Sports to help it grow The FA People’s Cup after having run the event in-house for two years. 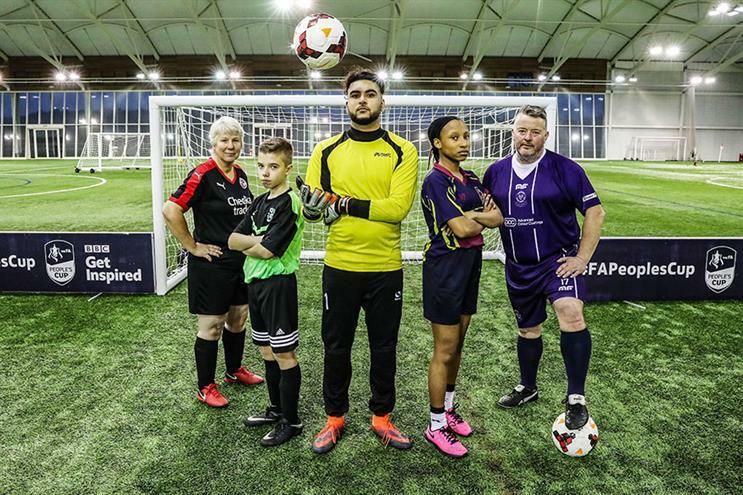 The free event, in partnership with BBC Get Inspired, has more than people 40,000 registered and the FA has added two new categories bringing it to a total of 18. There will be nationwide events, with the first round kicking off on 23 February. The finals are on 28 and 29 April at St George’s Park, the England football team’s training ground. The winners will be awarded their trophies at Wembley over half-time at the FA Cup final. Georgina Lewis, head of marketing for the FA Group, told Campaign: "[Appointing Limelight] will enable us to scale it and do it in a professional way, to give every one of those participants a really great experience. Prior to that we delivered it in-house and reached a critical mass. "It’s really important for us that everyone has a great experience, the day is for the players to make sure they get a certain amount of playing time … and there’s a consistent and professional experience." She added that the aim of the tournament is around the "grassroots game" and allowing everyone around the country to play football. Lewis explained that the FA wants to make the game as inclusive as possible so has been working on making the tournament more diverse.